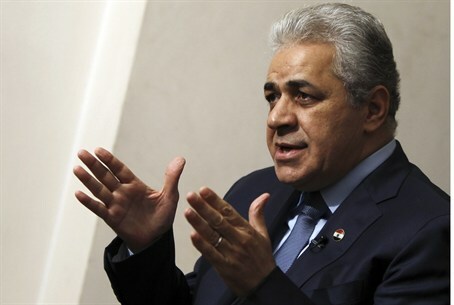 Hamdeen Sabbahi, who came in third in the 2012 elections, announces he will run again. A popular Egyptian dissident leader under ousted president Mohammed Morsi said Saturday he will stand in upcoming elections, in a contest likely to pit him against army chief Abdel Fattah al-Sisi, AFP reports. The announcement on Saturday by socialist activist Hamdeen Sabbahi signals growing concern among some Egyptians over a return to military rule if Sisi wins the vote. Sabbahi came third in the 2012 elections won by Morsi, who was toppled by Sisi in July last year after a turbulent year in power. Some of the other candidates who ran in that election have said they would support Sisi if he nominates himself. In a speech to his supporters broadcast live on television, Sabbahi announced his nomination to chants of "our vote is for Sabbahi." He denounced both Morsi and former president Hosni Mubarak, who was overthrown in a 2011 uprising and whose regime critics say is being resurrected by the military-installed government. "We will wage a clear battle," Sabbahi said, according to AFP. "I hope my decision has pleased the youths and respected their demands." If he runs, Sisi would enjoy the broad support of politicians and parties that view him as a sure bet and the man best suited to restoring order in the country. Sabbahi's candidacy, the most serious competition Sisi is likely to face, may attract the support of a small but growing dissident opposition movement, noted the news agency. Sabbahi was a leader of the National Salvation Front that organized protests under Morsi. Morsi's Islamist supporters are likely to boycott the vote and have previously said they would shun polls held by the military-installed government. Sabbahi was a leading dissident against Mubarak, who ruled for three decades. Sisi has yet to officially announce his candidacy, but he has already been backed by the top military council, and his aides privately say he has made up his mind to stand for office. Kuwait's Al-Seyassah newspaper ran an interview with Sisi on Wednesday, in which he said he would put himself forward. Egypt's army later said that the Kuwaiti newspaper had "misinterpreted" Sisi’s comments and added that he will make an announcement directly to the Egyptian people. Sisi took the approval of the constitution last month as a vote of confidence for his presidential bid. He has also been supported by Egypt’s interim Prime Minister Hazem el-Beblawi.